There’s nothing more satisfying than struggling with a really hard boss section in your favorite game and beating it after a lengthy amount of attempts. Aw c’mon, who are we kidding, repeating a battle over and over again gets old really fast, which is why things like cheat sites and walkthrough guides exist. For us lazy pigs. 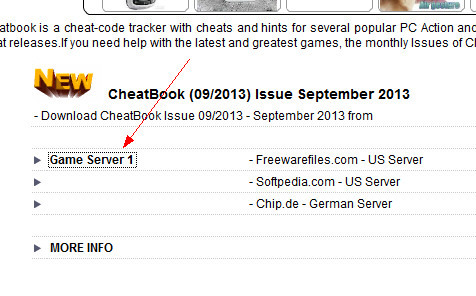 The CheatBook Database 2013 is the uber resource for anyone wanting to cheat…ahem…finesse their way through their computer and console games. The database really is gigantic, containing cheats for over 350 PC games, 37 consoles and 8 walkthroughs. The titles range from Call of Duty to Angry Birds, so chances are if a cheat exists, you’ll find it in this directory. The only problem is you have to fight your way through an absolute labyrinth of advertising and fake download links in order to actually grab the software itself. We’re not sure how much money these guys are making off this tortuous navigation, but we’re betting it’s A LOT! We inadvertently clicked on an Adsense ad within 2 minutes of landing on the page and nearly installed some toolbar laden junk, and if you replicate that enough times, it’s a lot of cash (and toolbars). So here’s a quick guide to avoiding the pitfalls involved in downloading the Cheatbook. It’s our own cheat book if you like, how’s that for justice? There are 6 (yes six…count ’em) different pages you need to traverse in order to finally get the download you’re after. And each step is filled with fake download buttons which are really Adsense ads. It’s the nightmare navigation maze from hell. We point out the real route to the treasure below. Follow the red arrows to make your way there. 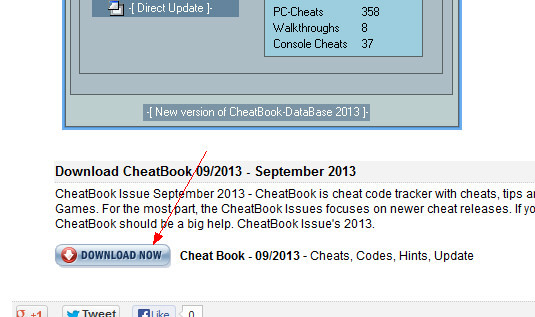 From the home page you will find the link a third down the page, not labeled download funnily enough, but called Cheatbook Issue September 2013. Ignore all the other HUGE links and words like Download on the page. They’re advertising dummies. This URL changes with each issue of course but the download link will hopefully still be found at the bottom of the page. This time at least it’s clearly marked, if small. And at least this time there are *only* two HUGE Download buttons from Adsense at the top of the page to try and fool you. Another nice page view is racked up by the developers (ka-ching! ), as they offer us a series of somewhat confusing servers from which you can download. In the event, for this issue there was only one server link. But it’s still confusingly embedded amongst a lot of other junk. There are THREE brightly colored Start Download links on this page to navigate through at the top. We must be getting close now, surely? We’ve actually moved off site to a 3rd party freeware site now, and at least there’s a big blue button marked Download Now. This must be the one. Oh please let it be the one. But watch out for the biggest DOWNLOAD button yet, in green and with a big arrow, sitting at the top right of the page. It’s a trap OK, a trap. Aaargh…this can’t be happening, it’s another page with a download link. They’re never going to let us get this file, we’re doomed, doomed I tell you. But hey, we might as well press it now we’ve come this far. After we’re almost family. Oops, nearly pressed the green advert Download button again, instead of the link. Yep, another Adsense ad. My aren’t Google making a lot of money out of this single download? HALLELUJAH, at last, at long long last. We have a dream, that one day, every man, woman and child will be able to look at their screen and say…down at last, down at last, thank God Almighty, it is down-loaded at last. Six steps, goodness knows how many minutes, and for the naive and unwary at least one or two false clicks on adverts and maybe even some nasty toolbars installed on computers. It’s really such a shame that this sort of thing is allowed to go on, especially with the apparent approval of Google. It’s ironic isn’t it, that on the one hand genuine websites are being penalized all over the place for apparently having Adsense ads which are confusing to users, and yet this type of deliberately confusing stuff goes on all the time with download sites of one sort or another, whether it’s music or freeware. Such a shame.